The U.S. ambassador to Cambodia has responded forcefully to Prime Minister Hun Sen's accusations the United States is attempting to oust his government, saying the charges are "inaccurate, misleading and baseless." Ambassador William Heidt's remarks Tuesday came less than two weeks after the Cambodian government's September 3 arrest of opposition leader Kem Sokha, who has been charged with treason for allegedly plotting with the United States to strip power from Hun Sen. FILE - Opposition party Cambodia National Rescue Party (CNRP) President Kem Sokha adressess party supporters during the party's political congress in Phnom Penh, Cambodia, March 2, 2017. Hun Sen, a former Khmer Rouge officer who has ruled the southeast Asian country for more than three decades, has intensified his rhetoric against the United States amid a crackdown on opponents and the media before next year's general election. The Cambodia Daily, an English-language newspaper, was shut down last week by government authorities. More than a dozen radio stations that broadcast dissident voices or programming from U.S. government-funded Radio Free Asia and Voice of America were forced to shut down for allegedly violating regulations. The U.S. Broadcasting Board of Governors, which oversees Radio Free Asia and Voice of America, announced Tuesday it suspended operations of its RFA news bureau in the capital of Phnom Penh because an "intimidation campaign by Cambodia's government has intensified." "There has never been a more important time to hold governments accountable for treating press freedom as a human right and a universal priority," Broadcasting Board of Governors CEO John Lansing said in a statement. "The Cambodian government has only strengthened our resolve to continue to respond to threats and harassment with accurate, factual reporting, analysis, and other vital information," Lansing added. Lansing condemned the Cambodian government's actions and repeated a call for the government to allow journalists to work in "safe, unfettered conditions." He also called on the government allow the radio stations to resume broadcasting BBG programming. Ambassador Heidt demanded the government release Kem Sokah and establish a dialog between the government and the opposition to "salvage" upcoming elections. "If Cambodia's elections were held today, no credible international observer would certify them as free, fair and reflecting the will of the Cambodian people," Heidt said. 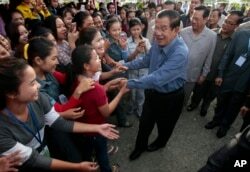 FILE - Cambodia's Prime Minister Hun Sen greets garment workers during a visit to the Phnom Penh Special Economic Zone on the outskirts of Phnom Penh, Cambodia, Aug. 23, 2017. Hun Sen, one of China's closest regional allies, threatened Monday to dissolve Kem Sokha's Cambodia National Rescue Party if it continued to support him. 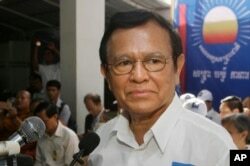 Kim Sokha is the only serious challenger to Hun Sen, who could face his biggest challenge in next year's elections.